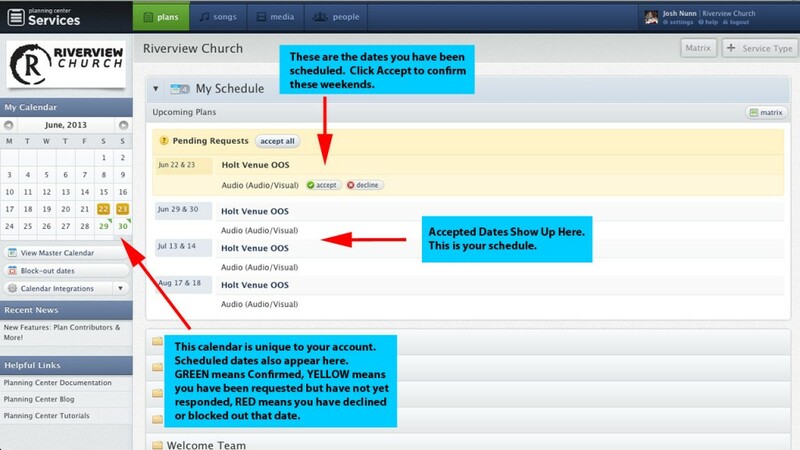 Click the PCO link to find out everything you need to know about the days you are scheduled to serve. 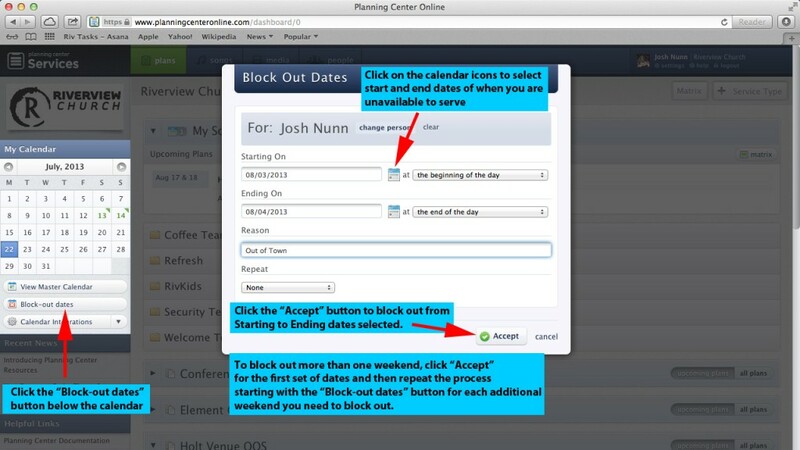 To login to Planning Center Online, go to www.planningcenteronline.com and click the “Login” button on the top right corner. Enter your user ID (which is your email address) and your password. Once you login to planning center, you will have access to the dates you are scheduled to serve and information pertaining to those weekends. Below is an example of your Planning Center main page. 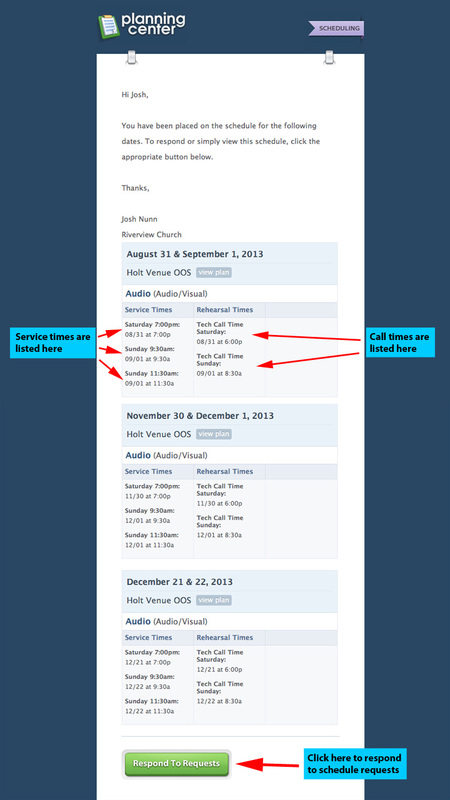 This is where you will see your schedule, your calendar, and any service requests that you have not yet responded to. Planning Center provides the option to “Block Out” dates that you know you are not available to serve. To block out a date, click the “Block-out dates” button below your calendar, select a start and end date for when you will not be available, and click accept. To help remember dates that you have been scheduled, you can integrate your Planning Center calendar with iCal on Mac, Outlook on Windows, and Google calendars. You can also integrate Planning Center with your Facebook account. 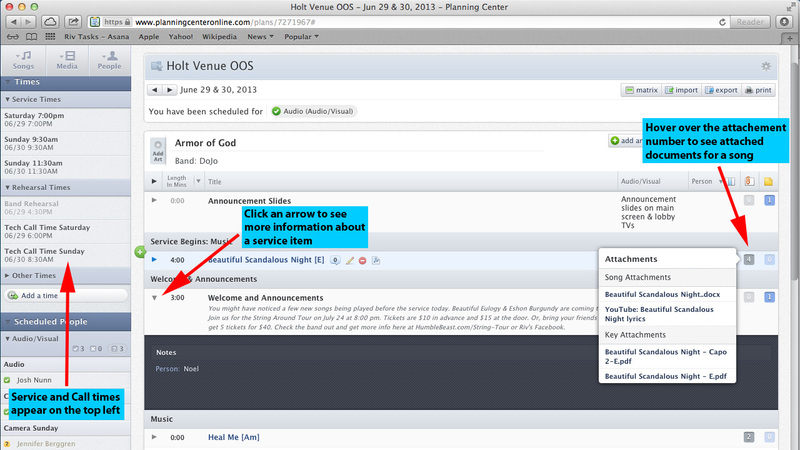 By clicking on one of the dates you are scheduled, you can view the service plan for that weekend. Specific details about songs, special elements, and final service order are updated on Thursday of each week. At least once a quarter you will be receiving a scheduling email similar to the one below. This email verifies that you have been placed on the schedule. We need you to open this email and click the “Accept” button if you are able to serve that day. If you are certain you will not be available to serve, click the “Decline” button. By accepting the scheduling requests, we will know you are confirmed to serve that weekend, otherwise we’re not sure if you will be there or not. You should also be getting an email on Thursday before the weekend you are serving just as a reminder. Below is a video tutorial showing how to login, check your schedule, and block out dates. 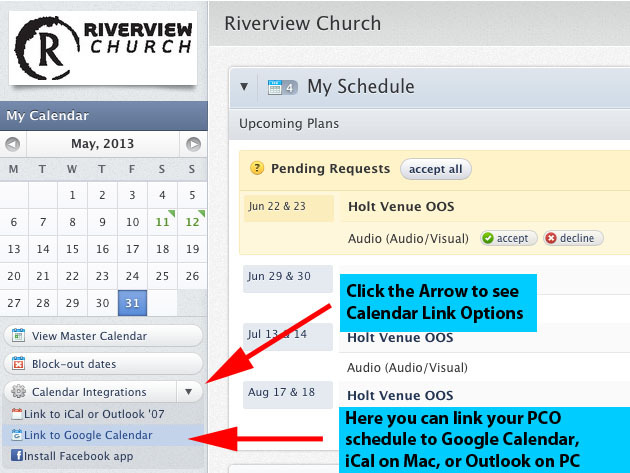 If you have any questions about Planning Center, contact Josh Nunn at josh.nunn@rivchurch.com.